Whither the internal combustion engine? Eric Johnson and Ben Witt were showing very little concern for the nation’s fossil fuel-based economy on Thursday morning outside GBM. 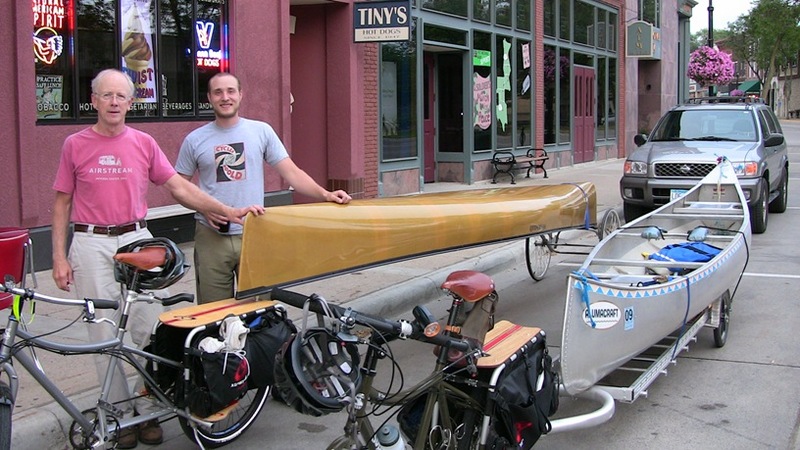 Ben has the complete story on a Milltown Cycles blog post titled Big Dummy Canoeing. What is that OTHER trailer, the one that is NOT the Bikes At Work trailer? I have a dream of completely eliminating the back-and-forth needed to drop off and pick up a canoe on a one-way river trip. Bike the canoe to the river put-in. Canoe the bike to the take out. That smaller trailer (Eric Johnson’s?) looks almost small enough to be thrown in (or perhaps lashed on) the canoe for the trip down river, along with a partly disassembled bike. ..but I don’t have the time/skill to do this myself, so I’d be interested in a kit or commercially available model. Patrick, I’ll nudge Eric and Ben to see if they can answer your questions.